A glorious example of the rich cultural life of Turkish Jews, the Ahrida has its rightful place among major synagogues of the world. 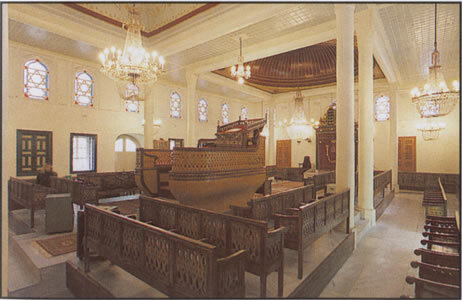 The oldest of Istanbul's 16 synagogues in use today, located in the neighborhood of Balat (Istanbul), the Ahrida dates from the early 15th century. A remarkable feature of the Ahrida is its Teva (Bima) which is in the shape of the prow of a ship. The tradition says that it symbolizes either Noah's Ark or the Ottoman ships which transported the Sephardim from Spain to Turkey. Its design is impressive and memorable. The Ahrida was badly damaged by a fire in the late 17th century, which may even have destroyed it completely. The exact year of the fire is unknown, but an imperial Berman dated 1694 calls for the rebuilding of the synagogue, which was done at the time in the Baroque style of the Tulip Period. The restoration project, overseen by architect Husrev Tayla, revealed various styles of architecture layered one on top of the other.